Kimpton: 1001 reasons to talk | Andy Sernovitz | Damn, I Wish I'd Thought of That! Kimpton Hotels is all about awesome service and they are great at word of mouth-worthy promotions. Created by the legendary guitarist, musician and artist Jerry Garcia, the J. Garcia Suite positively pulses with good vibrations. Guests will get into a mellow groove with the rich, relaxing swirls of color that surround them in the suite. The same luxurious silk fabrics used in Garcia’s fashion line flows over onto the room’s upholstery and the sinfully indulgent duvet bedcover. The self-portrait hanging above his many watercolors and the autographed wall add a personal touch that is unmistakably Jerry Garcia. Lesson: Reasons to talk go both ways. 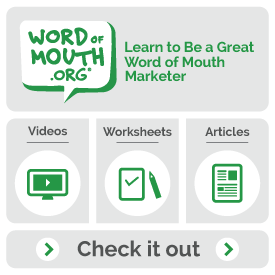 When you’re focused on the word of mouth upside, make sure you’re covering the basics. Once you get people talking, they are going to talk about everything. Update: I used their web form to file a complaint and Lorraine MacDonald responded within 40 minutes with a nice note, an email address and a phone number where I could reach her directly. That’s the way to do it: A real person, a good answer, and a promise to follow-up.